A review of Connected in Cairo appeared in the Journal of African History 53(3): 412-413. 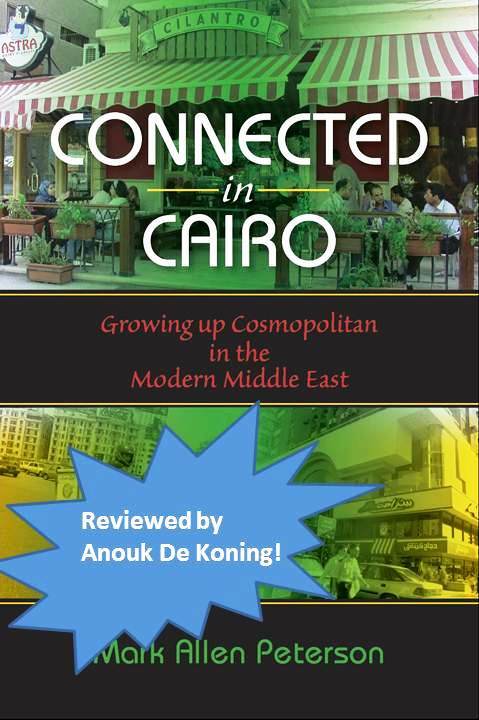 The review is by Anouk de Koning of the University of Amsterdam, author of Global Dreams: Class, Gender, and Public Space in Cosmopolitan Cairo (American University in Cairo Press, 2009). Peterson explores how mostly elite children, students, and entrepreneurs socially position themselves by drawing on consumption patterns, styles and discourses that signify a familiarity and connection with the West. These different protagonists walk a tightrope of social positioning in a landscape in which class, culture and forms of connectedness to the outside, particularly the West, are intimately related. In this context, cosmopolitanism can signify elite status but also inauthenticity, while the local can be read as both as lack of sophistication and as authentic. Peterson admirably combines these explorations with accessible theoretical discussions of media and globalization. …which is a pretty good brief summary. She has, however several criticisms. The ethnography is too thin. I fail to go beyond suggestive illustrations to show the social lives of the people I am describing in greater detail. The book pays insufficient attention to the political-economic and ideological climate of Egypt (at the time). The linkages between the Mubarak regime’s undemocratic neoliberal project and the languages, styles and consumption practices of those I’m describing are not drawn sufficiently. I can point to places in Connected In Cairo where I address all of these things, but the key word here is probably “insufficiently.” It’s like when I’m watching international studies capstone students presenting projects on a Middle Eastern topic and I wince at all the stuff they are missing; it hard to please someone like Anouk de Koning because she knows so much about the very issues I am writing about that she immediately sees what else I could have said. Connected in Cairo provides an accessible and instructive reading of the everyday construction and negotiation of what is oftentimes glossed as globalization, and will be of value to students and academics interested in the importance of social imagination in the making of local worlds in global times. ← Is Muslim to England as Coptic is to Egypt?